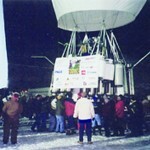 Just an hour after taking off from a quarry in Illinois, a helium cell in the balloon burst at 21,000 feet. Two hours later the 165′-tall balloon landed in an Indiana cornfield. 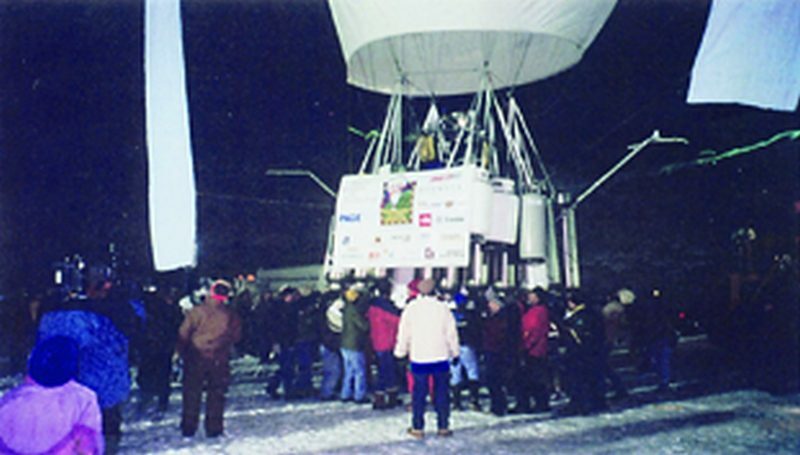 After bouncing and skidding across the snow covered field, the capsule, with Uliassi safely tucked inside, snagged an irrigation rig, finally bringing it to a halt. Uliassi is planning another round-the-world record attempt this fall. After patching minor cracks, the capsule is as good as new and ready for the next flight. Uliassi is expecting it to be about 20,000 miles longer than the last. 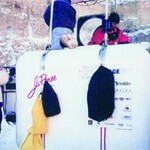 The 165′ high J. Renee just before take off from an Illinois quarry in 1997.